Miss almost 13 has a school social coming up next week with a 70's theme.... she has the coloured glasses and peace necklace and earring's sorted so all she needed were some groovy pants to wear. I think these should do the trick (although I probably should have flared the bottoms of the legs a bit more) and when the social is over she can use them as pyjama pants! Miss 12 decorated an old pair of thongs (flip-flops) with some flower trim to match. Lisa of A Spoonful of Sugar. They were really quick and easy to whip up and fit Miss 12 beautifully. I can see myself making more of these soon! 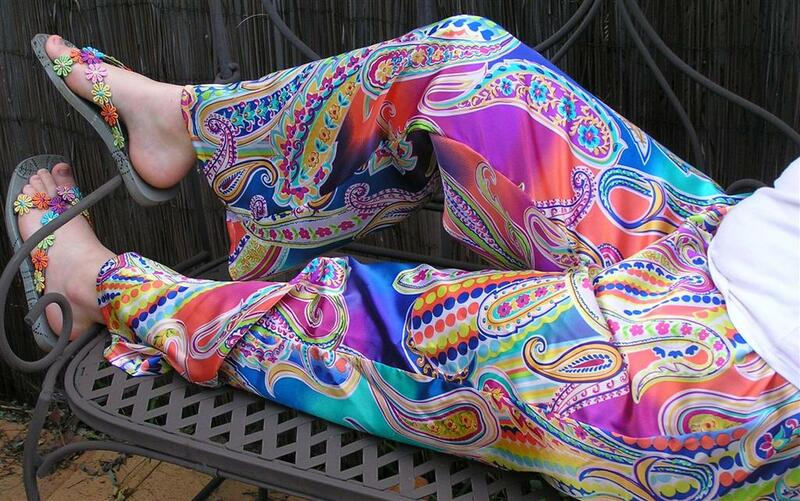 Oh more Lounge pants or retro hippy ones! Think you need a kaftan to go with them for the full effect! Takes me back a bit! Those hippy pants are fab!! They will start a trend, I'm sure!